With Spain's biggest international airport, Madrid is probably the most common arrival point for most people visiting Spain. So no wonder there are so many tours of Spain that depart from Madrid. Whether you have time for just a day trip or if you have a little longer to venture out of ​Madrid, you'll find something of interest on this page. 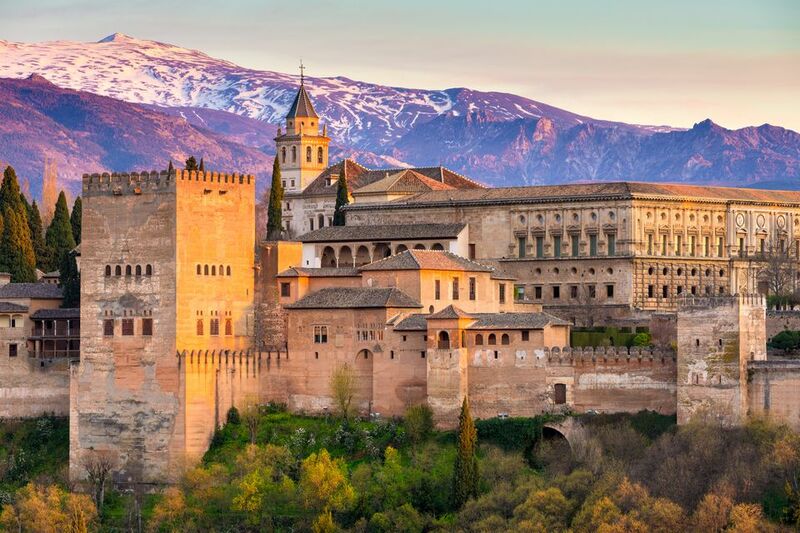 These Spain tours from Madrid are the best-guided trips you can do from the capital, with tours going to all corners of the country and beyond to Portugal and Morocco. The most popular tours from Madrid are the four- and five-day tours of Andalusia. They take in the most famous cities in Andalusia - Seville, Granada, and Cordoba - and usually fit in Toledo and Ronda too. But we're particularly fond of the four-day tour to Lisbon because they've cleverly arranged the itinerary so that you spend all three nights in the Portuguese capital, with all other cities visited either on route or as day trips from Lisbon. No need to pack and repack your bags each night! If you've only got time for a day trip from Madrid, you're probably going to want to visit one of Madrid's satellite cities: either Toledo to the south or a couple of the cities to the west: Segovia, Avila, Valle de los Caidos or El Escorial. Alternatively, you could always venture as far as Barcelona or Seville, trips only made possible by the high-speed AVE train. Andalusia is Spain's most popular region, with several cities that are vital for any Spain trip situated just a couple of hours apart. Seville is the spiritual home of flamenco and bullfighting and Andalusia's most visited city. Cordoba is not far from Seville and is home to the Mezquita, the grand mosque that was once the biggest in the world (and has now been converted into the city's cathedral), so adding this to your trip to Seville is a great way to get more out of your time. For a slightly longer trip, you can add Ronda, the pueblo blanco that is perched over a steep ravine or Granada, home to the Alhambra. Which would we recommend? The four-day Seville, Toledo, Cordoba, and Granada tour. The organizers of this tour have proportioned the four days perfectly, with half a day in Cordoba, a day and a half in Seville and a day in Granada. Then, on the way back to Madrid, stop off in Toledo for a brief look around there. Travel from the capital of Spain to the Portuguese capital, Lisbon, on this three-nights-and-four days tour. The best thing about this trip (apart from the sights themselves) is that all of the accommodation is at the same place - in Lisbon. Visit Trujillo in Spain on the way to Lisbon. Settle into your hotel and then have a guided tour of the Portuguese capital and some free time on your second day. On the third day, you will go on a day trip to Fatima, finishing up on the last day with a visit to Caceres on the way back to Madrid. This is a perfect introduction to some of the highlights of Portugal, as well as some lesser-visited sights in Spain, without having to move your cases every evening. This tour doesn't reach Porto, one of Portugal's real highlights, which is unsurprising considering the length of the tour. Visit Spain's most popular city, Barcelona, as well as Valencia (the home of paella) on this four-day tour from Madrid. You'll spend a night in Valencia and two nights in Barcelona, before returning to Madrid via Zaragoza. This tour of eastern Spain misses out Andalusia. For that, you'll need a longer tour. Visit the best of Spain's cities: Barcelona, Seville, and Granada as well as Cordoba, Valencia, and Zaragoza in this mammoth tour of the country. This seven-day (six-night) tour includes combines whistle-stop tours of the smaller cities with slightly longer stops in both Seville and Barcelona (where you'll spend two nights in each). If you only have a week in Spain in your life and need to see its highlights, this is the tour for you. Accommodation is at luxury hotels and many meals are included.